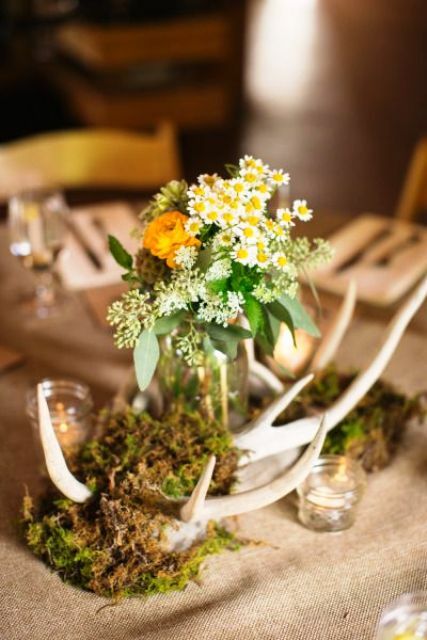 Antlers are cool natural decorations that you can use for your wedding in lots of different ways. 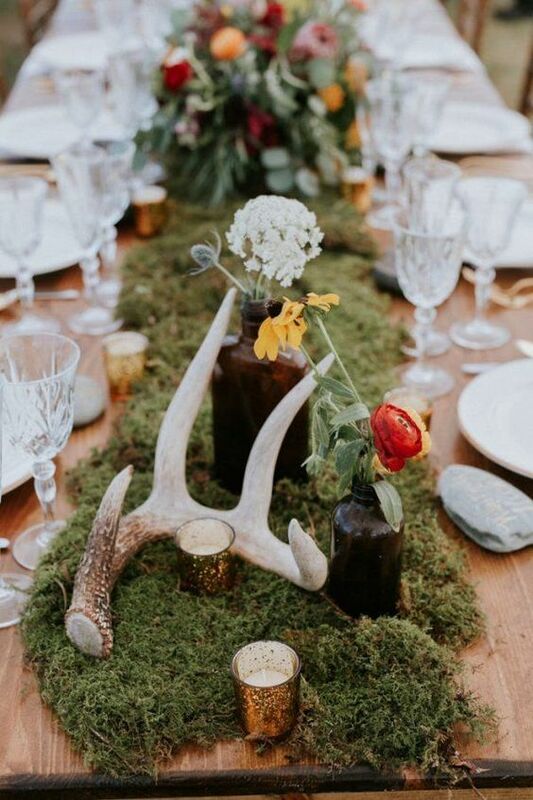 Antlers fit woodland, rustic, boho, mountain weddings, and they are naturally beautiful – no additional decor is required. 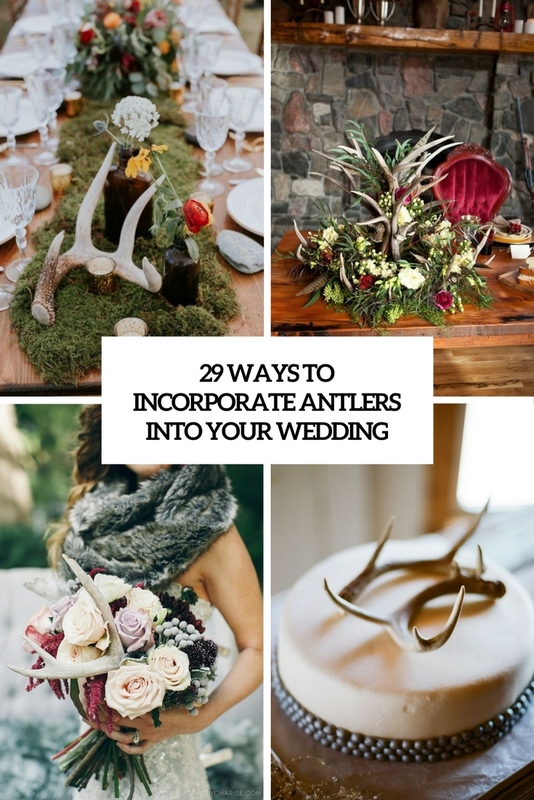 Let’s have a look how to incorporate antlers into your wedding decor to make them look cool and eye-catchy. 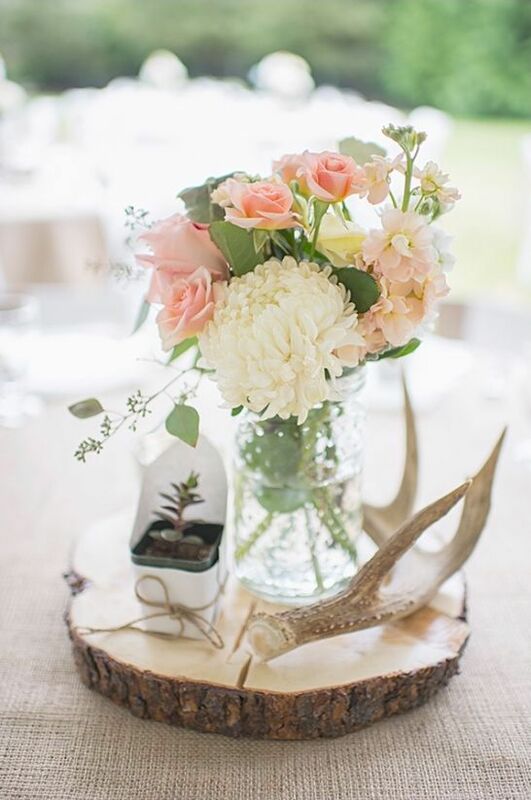 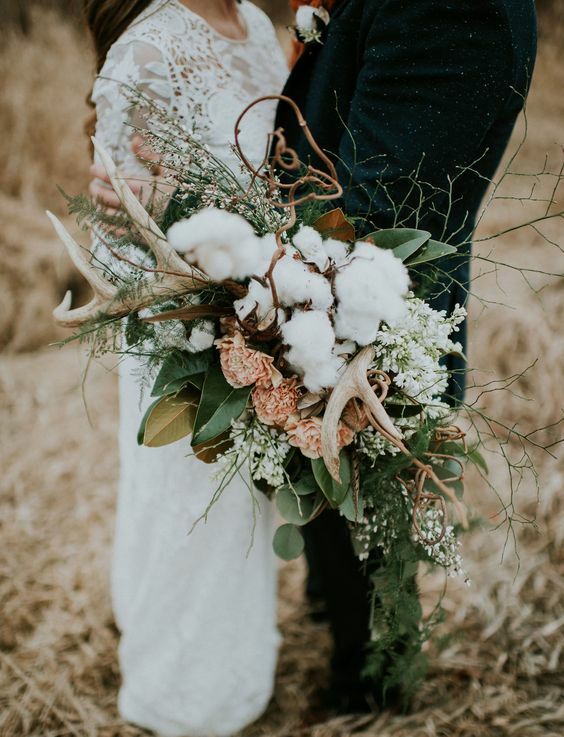 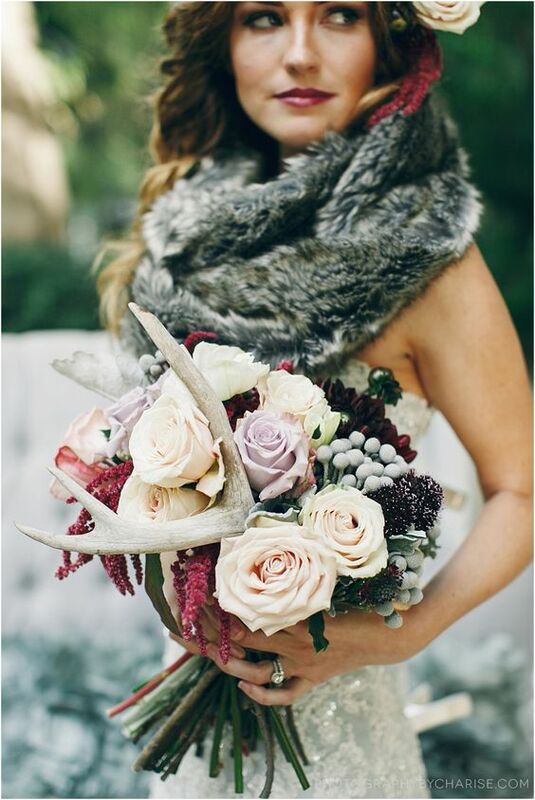 If you want a very special wedding bouquet, there’s a great idea to add a boho or woodland touch it: incorporate some antlers. 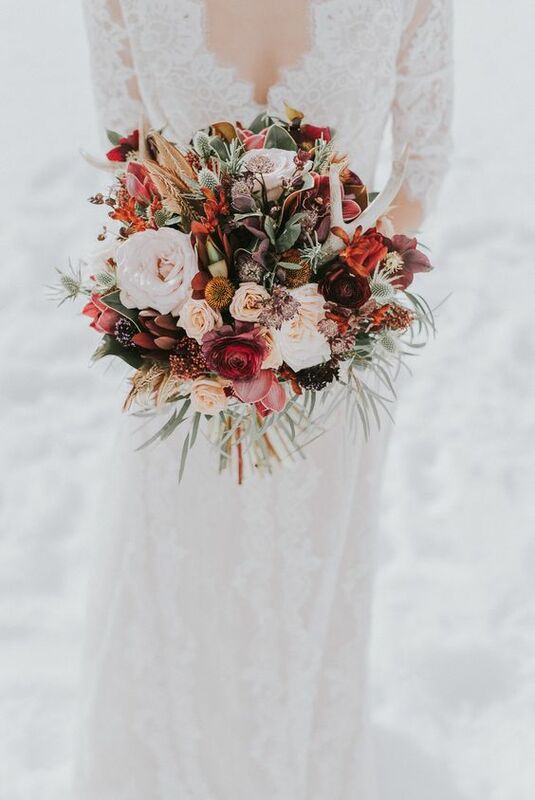 This is a gorgeous idea for a woodland or mountain fall wedding with a boho feel, just rock bold plum and red blooms, cotton, foliage and greenery for a texture and some antlers for a unique look – your bouquet won’t be unnoticed! 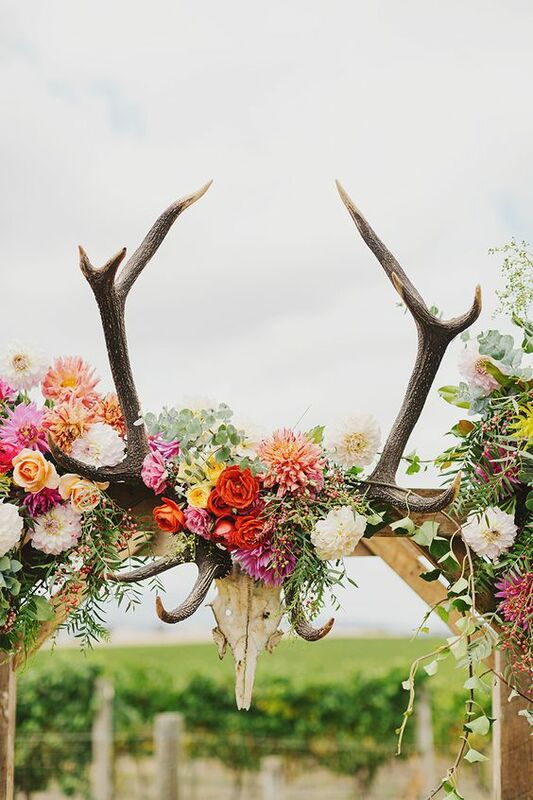 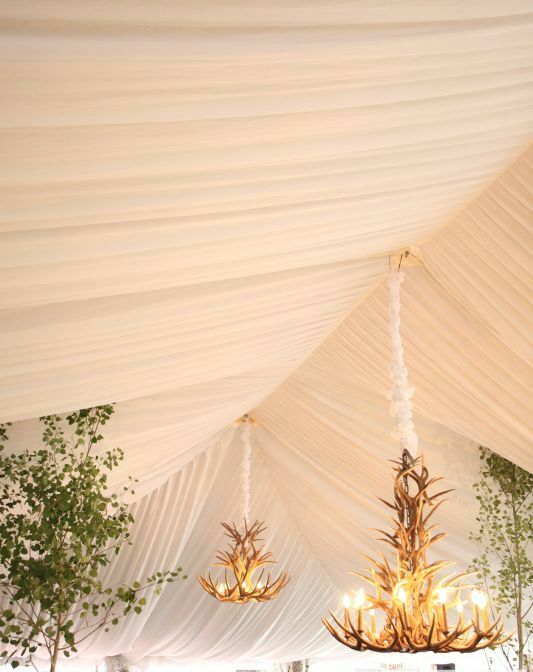 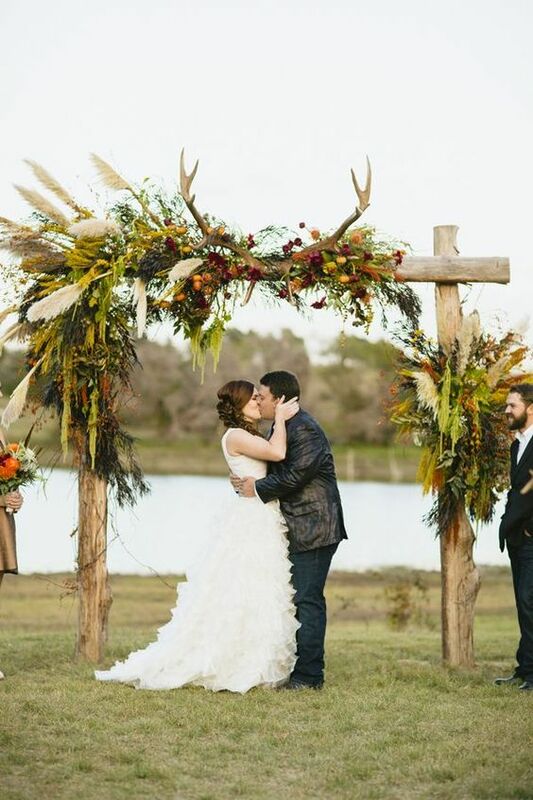 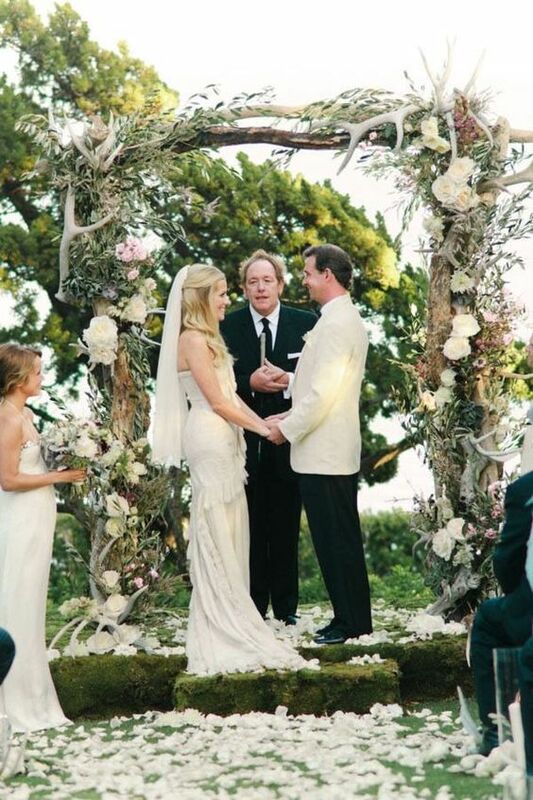 Decorate your wedding arch with lush greenery, blooms and add some antlers for unusual decor. 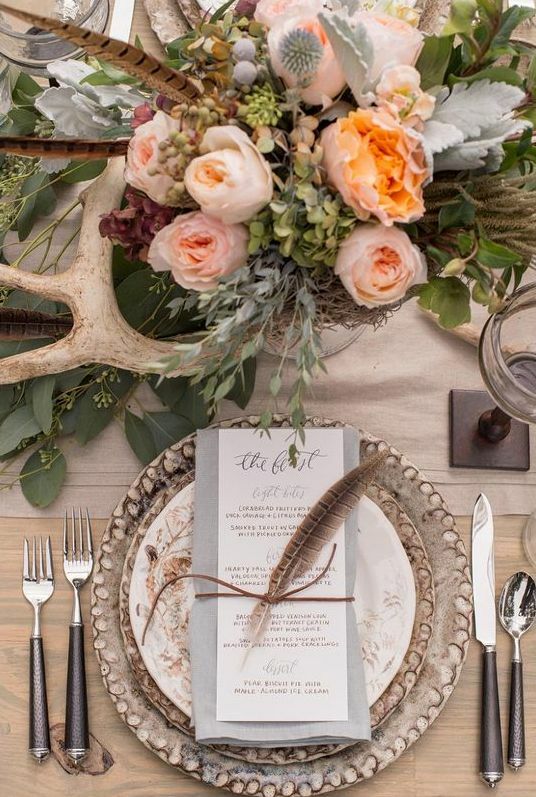 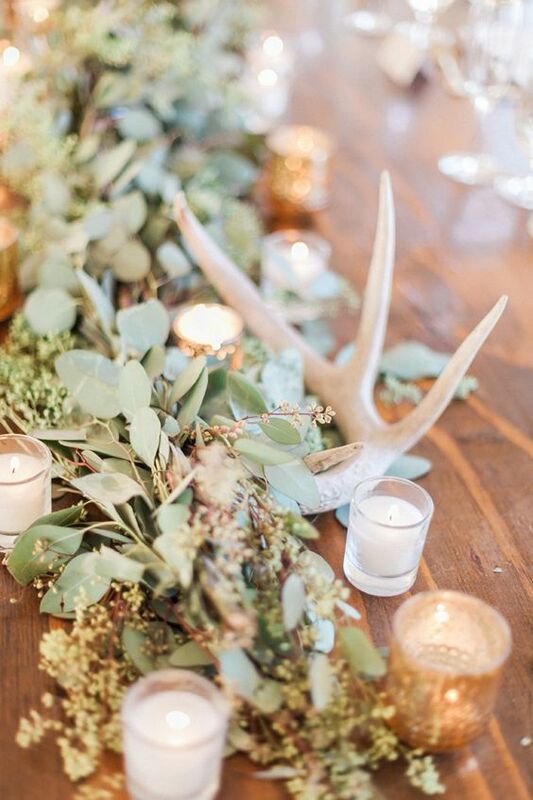 Antlers and feathers are great for adding boho chic touches or a mountain feel. 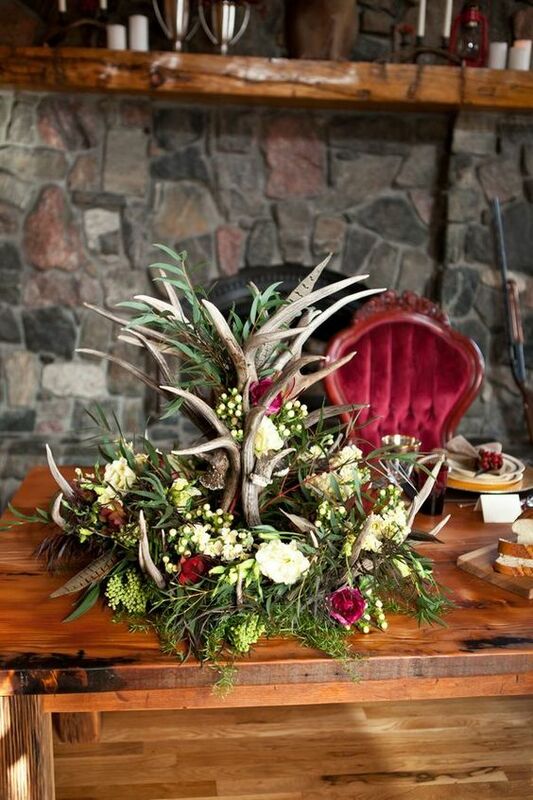 Antlers may cover the whole arch, or you can attach some above you two for an accent. 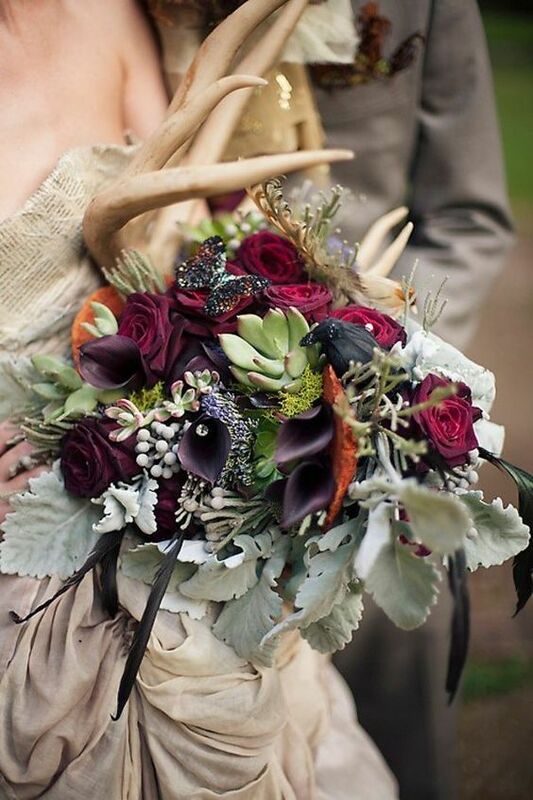 Line up your wedding aisle with blooms, candles and antlers – an ideal thing for a woodland wedding. 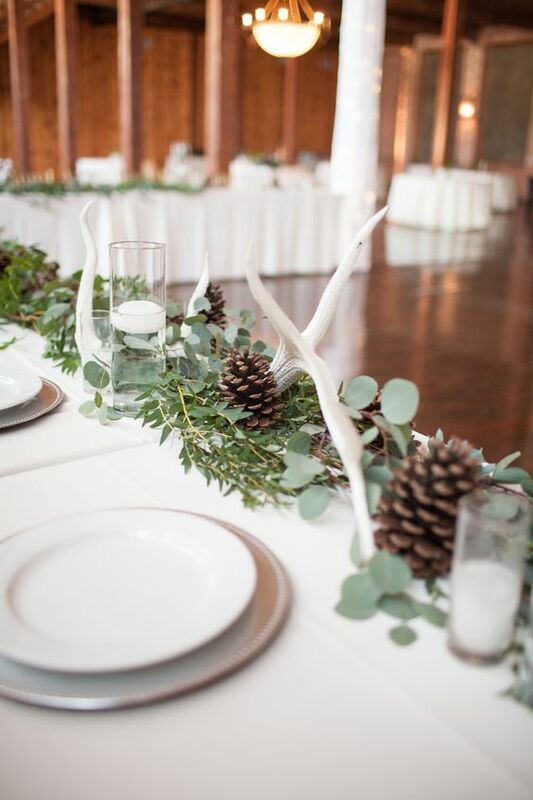 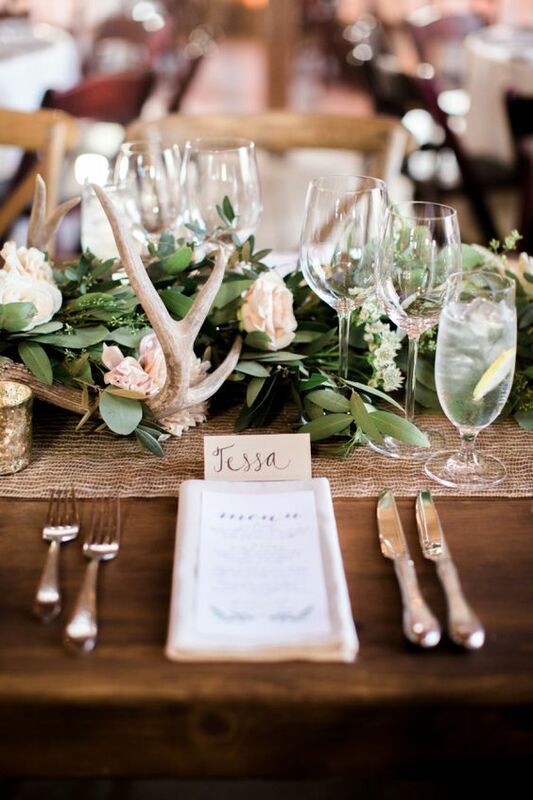 Antlers are perfect for decorating wedding tables – you can rock gorgeous foliage wedding table runners with candles, pinecones, moss and antlers. 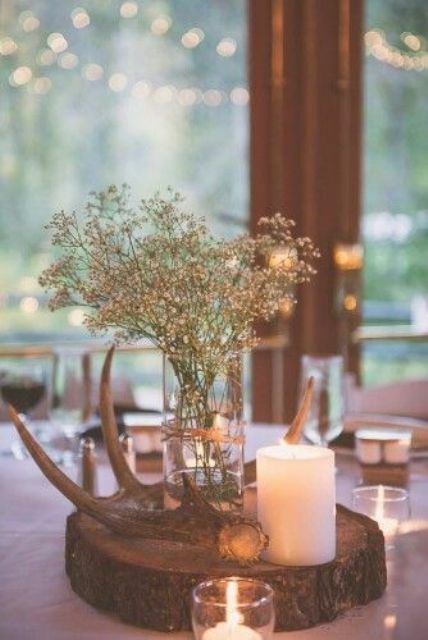 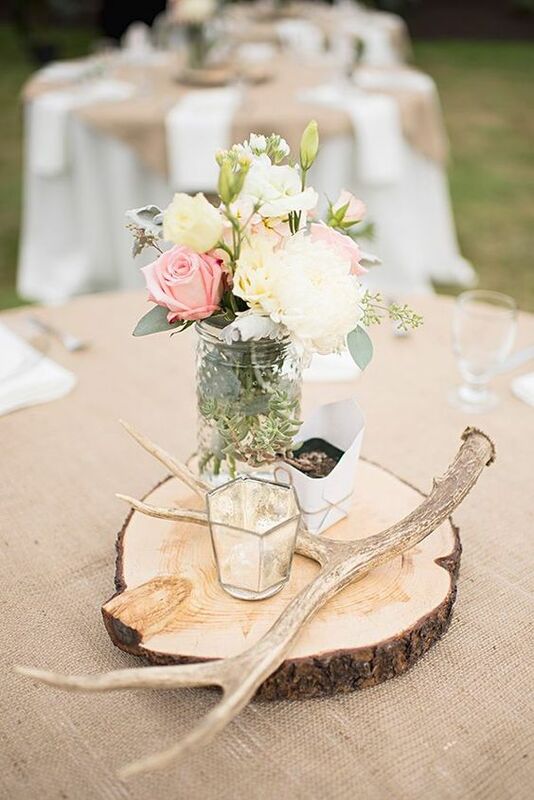 Another idea is to create simple rustic centerpieces with wood slices, succulents, antlers, various blooms that fit your wedding theme. 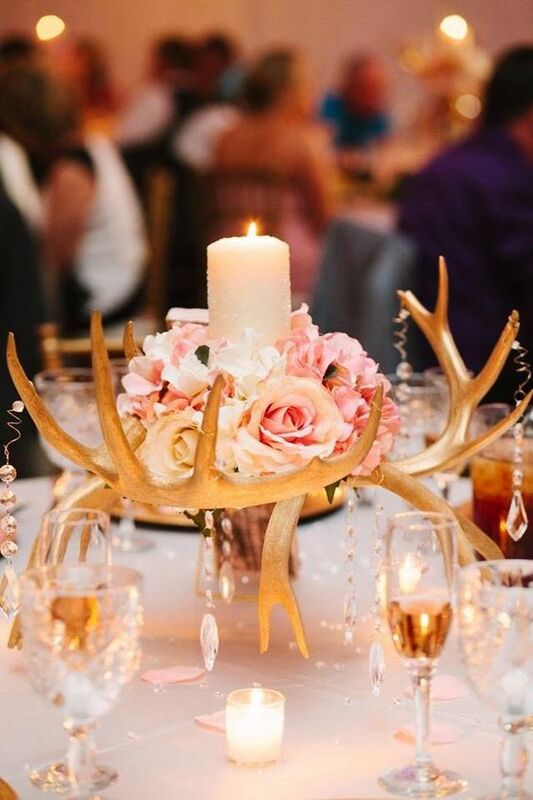 You can even create a rather glam centerpiece with gilded antlers, crystals and beautiful pastel flowers. 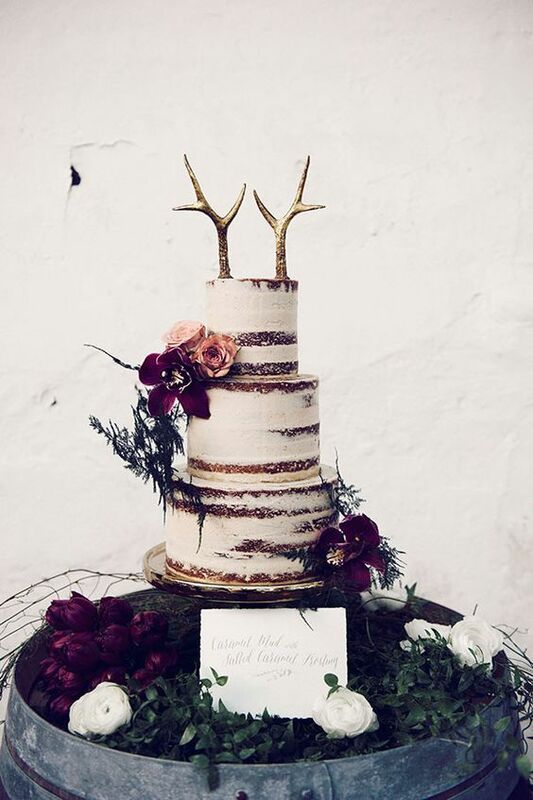 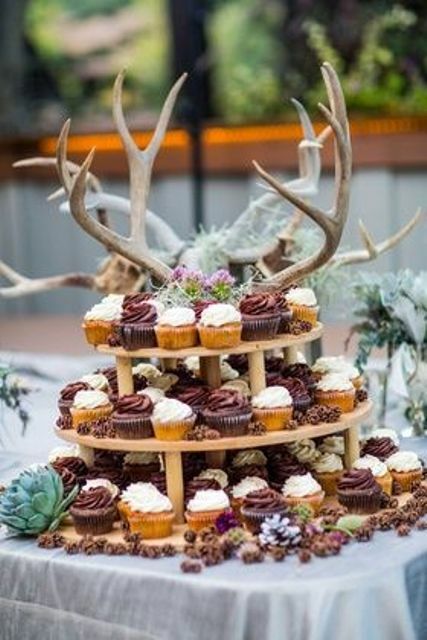 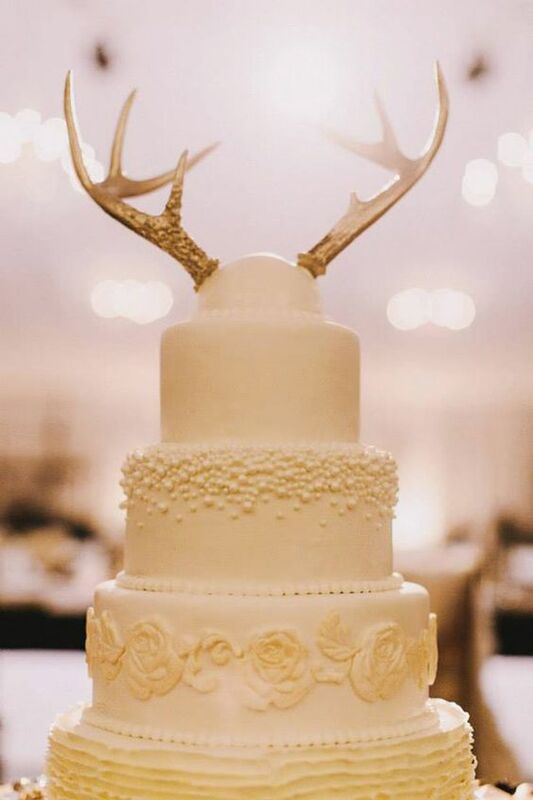 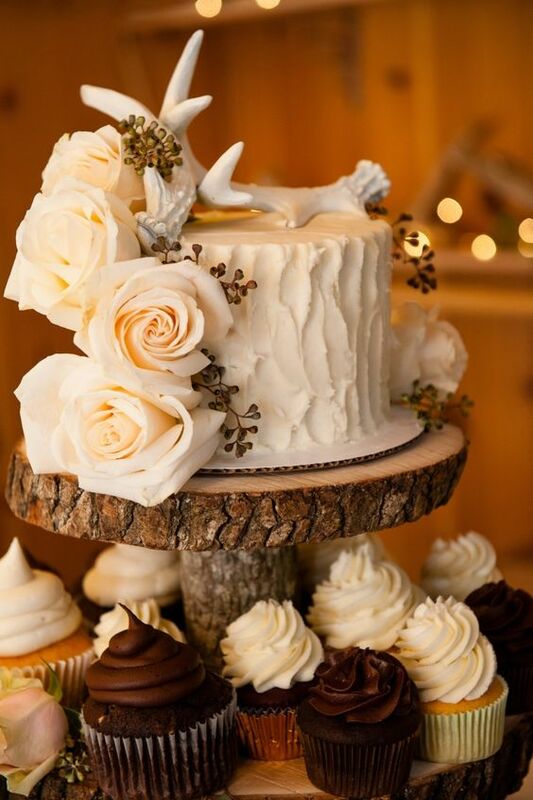 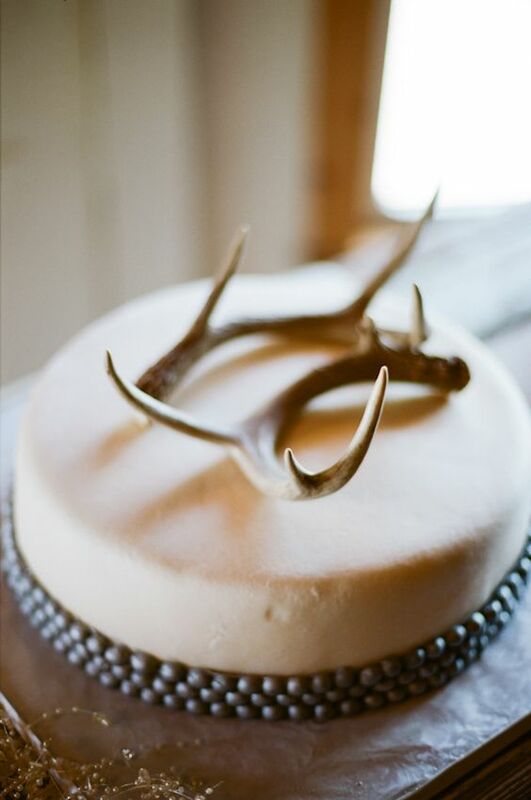 Serve your wedding cake on antlers to make it stand out! 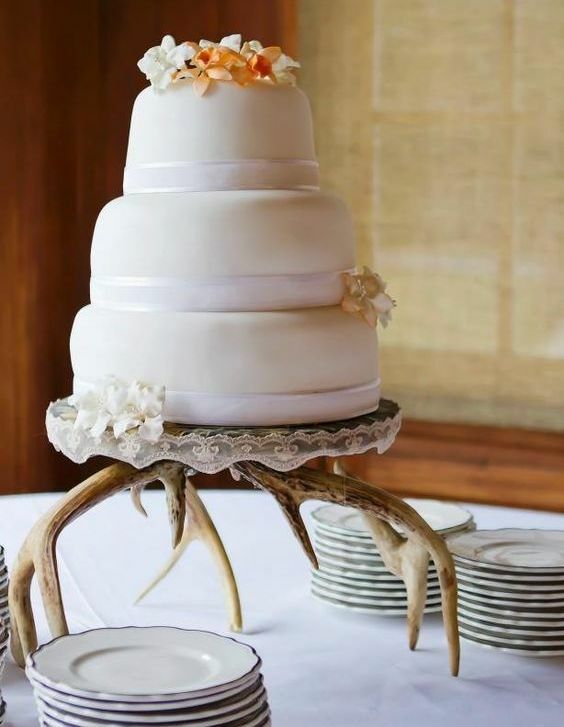 Another popular idea is rocking an antler wedding topper – they can be gilded or usual ones. 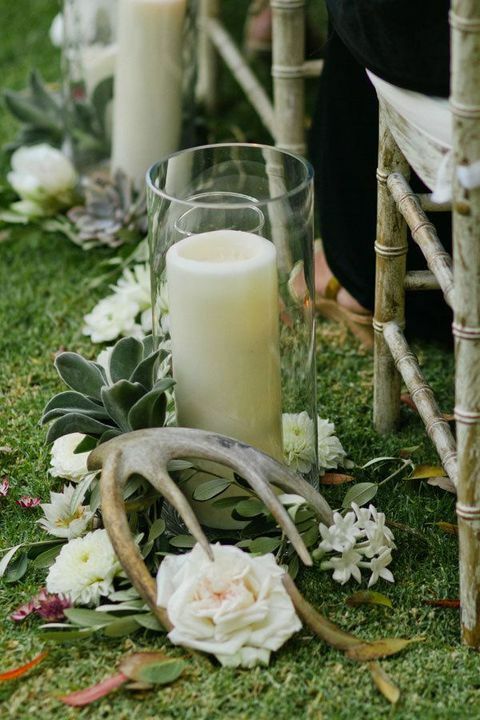 Just some antlers or antlers with foliage and blooms – it’s up to you and your wedding style. 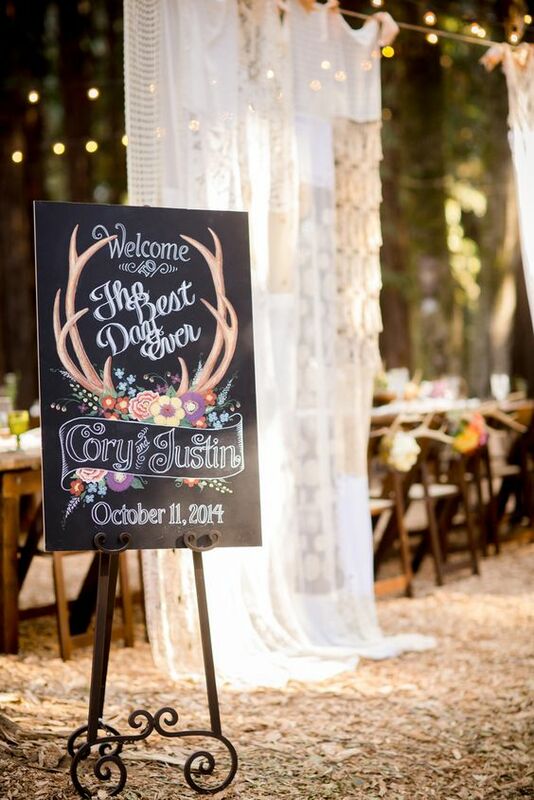 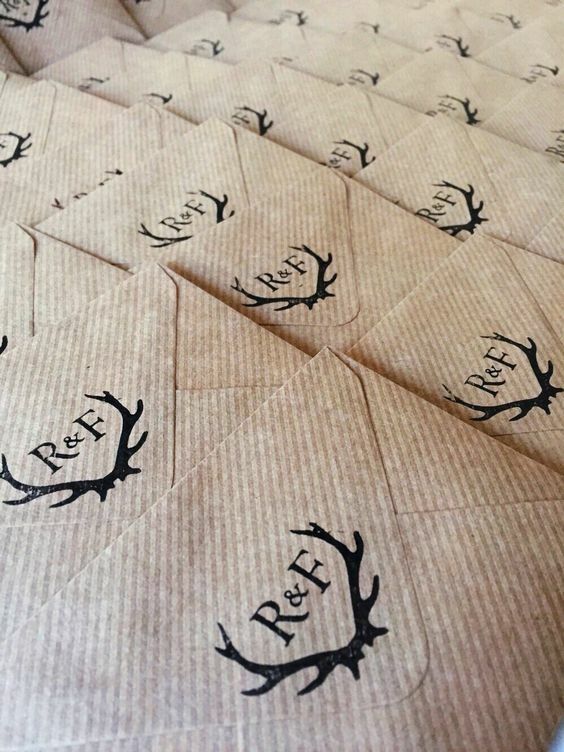 Antler printed stationery, signs, chandeliers and other decorations are welcome! 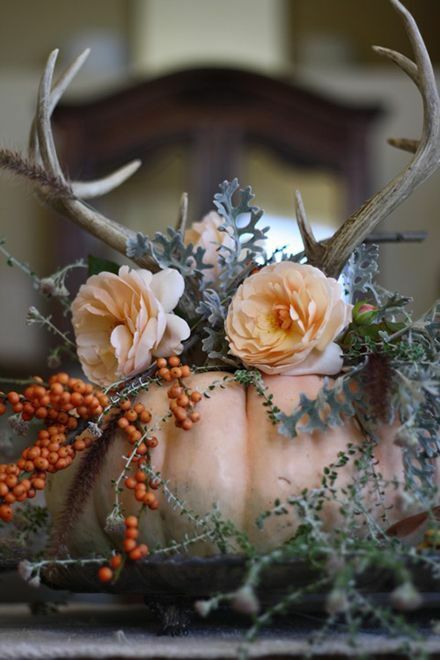 Turn on your creativity and create your own decorations with antlers, get inspired!